Where the students performance is deemed not-satisfactory - provide a copy of the comments / feedback, but not the checklist. This is to ensure the assessment remains valid on re-assessment. 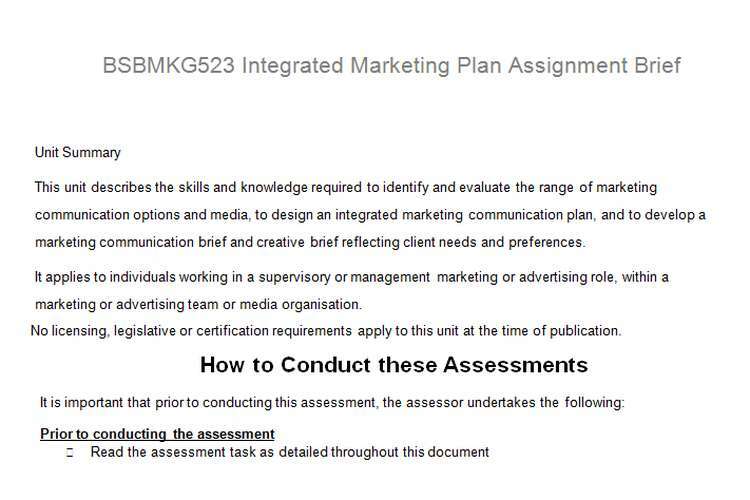 For this assessment, you are required to identify and evaluate the range of marketing communication options and media, to design an integrated marketing communication plan, and to develop a marketing communication brief and creative brief that reflect client needs and preferences. This brief will be the basis upon which your marketing communication strategy will be developed. Students have been provided with the following information: For this assessment, you are required to identify and evaluate the range of marketing communication options and media, to design an integrated marketing communication plan, and to develop a marketing communication brief and creative brief that reflect client needs and preferences. For this assessment, you are required to select and recommend media for your marketing strategy. The media vehicles that you select must match the requirements of the marketing brief for the product or service in your marketing plan. You must also recommend primary and secondary marketing media that meet target audience preferences and ensure the recommended media meets the brief, your client’s requirements and legal and ethical constraints. This information must be provided in form of a report. The report must be done on MS word. When you have completed the report, it must be printed and submitted along with this assessment and other projects. For this assessment, you are required to develop a design brief for your chosen media.